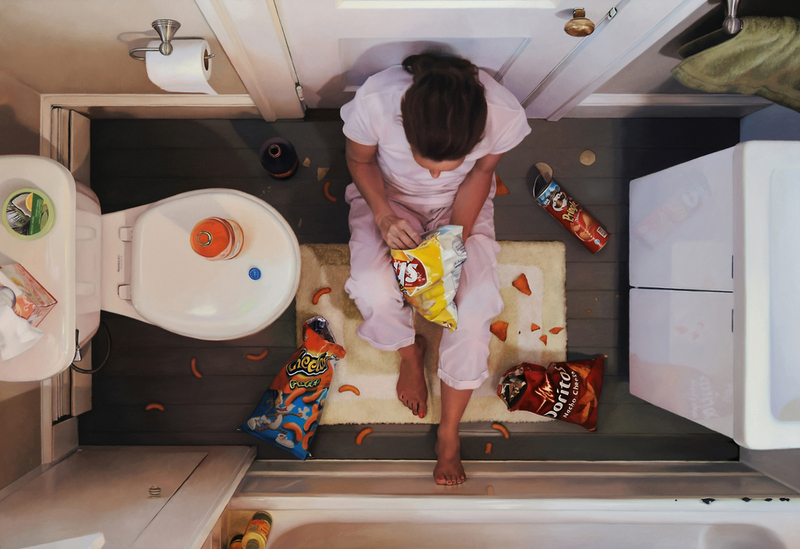 Lee Price is an American figurative realist painter. 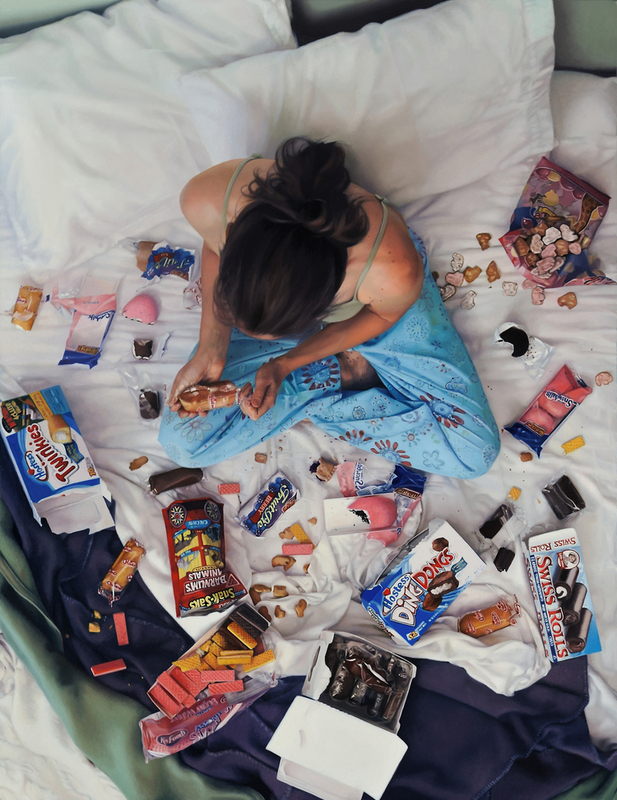 Her hyperrealist canvases contain candid, pseudo-photographs concerning the relationship between women and food. 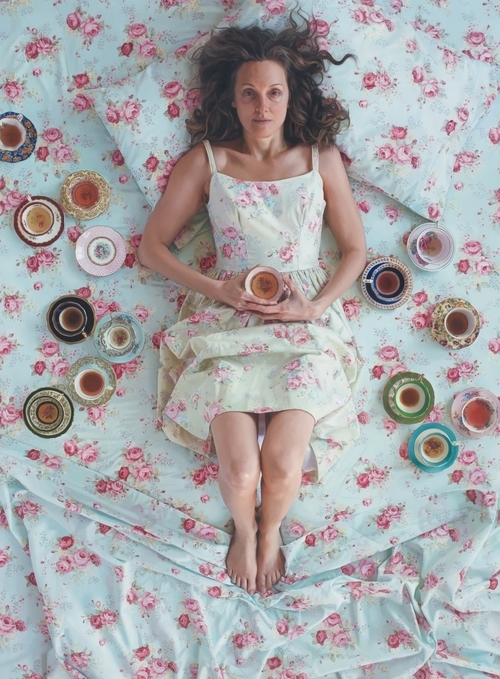 Sometimes evoking secret moments of binging, and others featuring lonely moments of tea-sipping in a bathtub, Price captures the quiet war of emotional eating, using herself as the subject. As a woman, I have been made to feel guilty for eating that extra french fry, for wanting that additional slice of cheese, or for not being petite. Women are constantly ‘food-shamed’ according to antiquated stereotypes of our gender should behave around cuisine. In short: eat little. We are held to impossible etiquette standards, we must be dainty, and yet, we must also be the cooks. Food, the sustenance of life, and for many a joy of life, is also something which seeks to control us. I have eaten crab rangoon in a bathtub. I have consumed a bag of Salt and Vinegar potato chips and a box of Oreos silently before a roommate came home. I have sneaked eating Frozen Yogurt on my walk home. I once got into a fight with a best friend over a box of Whole Wheat Strawberry Poptarts. All the aforementioned rest neatly in my annals of food guilt. Yet, some of my most cherished memories also contain the ignition of my olfactory bulb and gustatory delights: pizza from Jumbo Slice, 2 am chicken tenders from Wingo’s, a Philly cheesesteak, my anniversaries at Dovetail and Colicchio & Sons, a weekend olive oil tasting in Napa Valley, sashimi-delivery-for-two with my boyfriend in the tangled sheets. It wasn’t until the aughts that a woman finally won Nathan’s Hot Dog Eating Contest. I oscillate between a life of gluttony, of flippant uncaring, and of an extreme need to somehow tame my natural urges, and to count a calorie. My friends are all on a perpetual diet. I cannot read a woman-targeted magazine without an article on cholesterol, staying slim, or the right kinds of fats. If left unchecked, I would eat all of the world’s chèvre. But, in truth, I adore food. I adore it at least three times a day. And Price shows this edifying and celebratory (almost orgasmic) side of fare, as well. However, she neglects to include the communal connotations of a shared meal. From her studio in Beacon, NY, Price dreams up canvases “exploring food’s role as liberator, crutch, drug, and nourishment.” In a somewhat mocking turn, the city of Beacon, not far from the Culinary Institute of America, is also in the midst of a food revolution. The industrial town on Metro North has remained its relationship with farms not factories: Tito Santana Taqueria, The Hop Beacon, Homespun Foods, Max’s on Main, The Roundhouse at Beacon Falls, Cafe Amarcord. Let the food revolution continue.